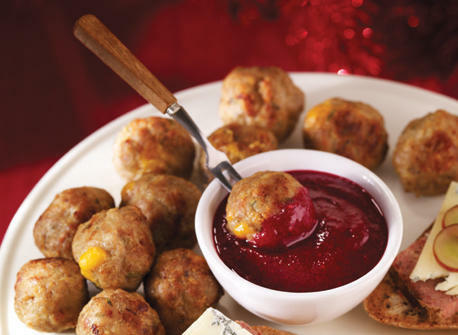 Perfect with cocktails, your guests will love these meatball hors-d’œuvres served with a fruit sauce, in this case maple-cranberry, served either hot or cold. Plus, every meatball is stuffed with a cube of melted Cheddar cheese. Superb! In a small skillet, bring cranberry juice and fruit to a boil along with maple syrup. Cook 8-10 minutes. Purée cranberries until smooth and add salt and pepper. Set aside, keeping warm or at room temperature. In a bowl, mix veal, egg, bread crumbs and rosemary. Season generously. Shape small meatballs by coating the diced Cheddar cheese with the meat mixture; it should be entirely coated. Arrange meatballs on a baking sheet lined with parchment paper and place on top oven rack; cook 8-10 minutes or until golden and fully cooked. Warning: do not overcook as cheese will melt and seep away. 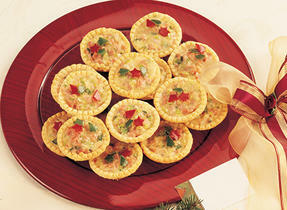 Serve warm, with the cranberry sauce as dip. 170 people love this recipe.